Whispering Pines community is sold out and is not in active development by builder. If you are interested in Whispering Pines or similar new home communities, contact us today! Our agents are very familiar with new and newer construction in Chesapeake, and can identify resale opportunities in Whispering Pines, as well as builder inventory available in nearby or similar communities in Chesapeake. To view 19 more pictures, interactive maps and the full, detailed description of the Whispering Pines community, please Login. Find a newer home with luxurious details in Whispering Pines. Each property in this Chesapeake real estate development illustrates exquisite builder craftsmanship. Homebuyers can appreciate this section of Hampton Roads that offers peace away from the noise of the city, but is close enough for all the excitement. This newer established neighborhood is located in desirable Great Bridge. Commuters won’t have trouble making their way to local military bases like the Coast Guard Finance Center, NAS Oceana in Virginia Beach or Norfolk Naval Shipyard. Life in southeast Virginia is filled with too many perks to count. Drive into this tiny community and it becomes abundantly clear that each of these six houses has stylish comfort galore. Each piece of real estate here is distinct, while offering upscale features that are in demand. Every home in Whispering Pines may come with custom cabinetry, sunroom, granite countertops, security system, ceramic tile flooring, fireplace, hardwood flooring, front porch, utility room and two-car garage. One of the primary reasons people keep flocking to this region is the schools. 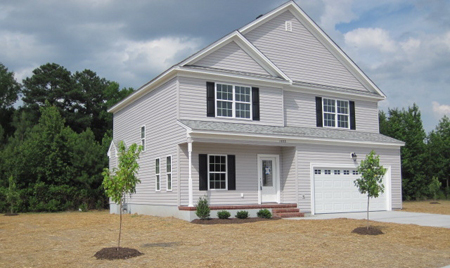 Homebuyers seeking fine schools can certainly find them in Chesapeake, VA. Those who purchase a home in this new home community can send their children to excellent public schools. Young children go to Cedar Road Elementary, tweens attend Great Bridge Middle and teens attend the acclaimed Grassfield High. While all of the cities in Hampton Roads offer homes, history and scenery, not all of them are growing like Chesapeake. This city isn’t old like Norfolk or Portsmouth, but it is attracting positive attention all the same. There are many green spaces, parks and recreational facilities. Families can utilize soccer fields, baseball diamonds and municipal golf courses. Shopping and entertainment are nearby as well. Local events take place throughout the year, so boredom is not an option for these lucky residents. Buying a new construction property in new home community, Whispering Pines, is not only an investment in real estate, it’s an investment in a lifetime of happiness. Send me more information about communities similar to Whispering Pines. Our agents gladly offer FREE property tours of Whispering Pines, Chesapeake and homebuyer consultations to all serious buyers.